The poker community might call him the most disliked player in poker, but after Tuesday’s action at WSOP Europe 2017, they have to call Chris Ferguson a six-time WSOP bracelet winner and will most likely soon have to call him the 2017 WSOP Player of the Year. 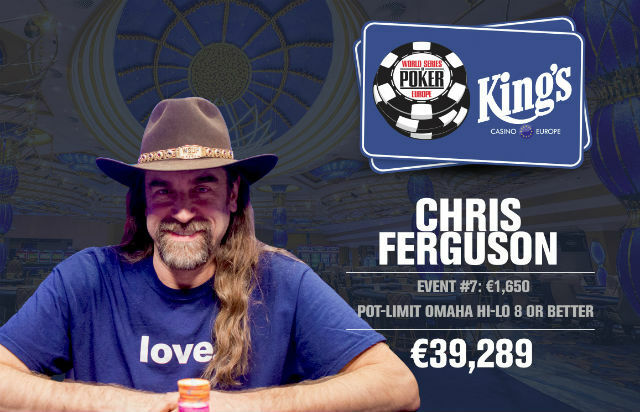 Ferguson came to the eight-handed final table with just 15 big blinds but managed to navigate his way to victory by eliminating his final four opponents. From UTG+1, Sebastian Langrock raised to 35,000 before Artur Sojka made 123,000 from Langrock’s direct left. Action folded to Langrock who called all in and turned over while Sojka showed . Things got interesting on the flop when four cards appeared. After a quick check with the floor staff, the four cards were re-shuffled and a flop of was dealt out. The turn was the to put Sojka ahead. The river gave Sojka the high and the low and eliminated Langrock in eighth place. Roughly an hour later, Sojka sent another player to the rail. Dario Aliota raised to 56,000 from the button and Sojka re-raised to 192,000 from the small blind. Aliota called all in and showed and Sojka tabled . The board ran out to send Aliota out in seventh place. It was yet another hour before the next elimination. Stanislav Wright opened to 45,000 from the hijack before Divanshu Khurana raised to 165,000 from the cutoff. Wright called and Khurana accidentally exposed his hand. Play was allowed to continue and the flop came . Wright announced he was all in and Khurana called all in. Wright had while Khurana held . The turn was the and the river was the to eliminate Khurana. Ferguson’s assault on the chip lead began with a double up the through Rex Clinkscales. On the next hand, Clinkscales called from UTG, Ferguson raised to 90,000 from the button and Clinkscales moved all in for his last 285,000 and Ferguson called. Clinkscales showed while Ferguson had . The board ran out to give Ferguson a full house and bust Clinkscales in fifth place. Four-handed play lasted almost two hours before Ferguson sent another player packing and neared the chip lead. Ferguson raised to 90,000 from the small blind and Sojka called from the big. The flop came and Ferguson bet 180,000 and Sojka called all in. Ferguson showed while Sojka was drawing with . The turn and river gave Ferguson Broadway and left Sojka out in fourth. Ferguson continued his rampage and 20 minutes later, found himself heads up for a bracelet for the second time in 2017. Ferguson raised to 90,000 from the small blind and Eldert Soer called from the big. The flop came and fireworks ensued. Ferguson bet 120,000, Soer raised to 540,000, Ferguson announced he was all in and Soer called all in. Ferguson showed while Soer showed . The turn took the low away from Soer and the river gave Ferguson the wheel for the low and a six-high straight for the high to scoop and bust Soer in third place. It took just 10 more minutes for Ferguson to put a bow on bracelet #6. Ferguson raised to 90,000 and Wright called and then moved all in after the . Ferguson called and showed while Wright was behind with . Neither the turn or river were good enough to give Wright the low and he was out in second place, leaving Ferguson to pose for the winner photo with his sixth bracelet. In mid-June, Ferguson got heads up with Mike Wattel in the $10,000 Seven Card Stud Championship event. Wednesday’s victory gives Ferguson an even bigger lead in the 2017 WSOP POY race. He was already leading coming into Wednesday’s action and added 98.84 points to his total. Ferguson, one of the key figures in the demise of Full Tilt Poker after Black Friday, had not played at the WSOP since 2010 before showing up during the 2016 Las Vegas events. His return was not met with widespread joy from players still angry over the financial mismanagement of Full Tilt Poker. Ferguson believes the break might have done his poker game some good.